Complete with a digital projector that lets you stream movies in the middle of nowhere. Nissan is bringing a mystery new concept to the 2019 Geneva Motor Show, but the automaker has decided to unveil an entirely different concept a few weeks before the show begins. The automaker has collaborated with OPUS Campers to create the high-tech X Concept camper, which integrates the automaker’s recently unveiled Nissan Energy ROAM, "a portable, all-in-one, weatherproof power pack” that uses second-life Nissan EV batteries to deliver up to a week's worth of remote power for campers who go off the grid. The battery pack has a storage capacity of 700Wh, a power output of 1kW, and offers a 12v and 230v power supply. Whenever it needs recharging, it can be taken out of its housing within the camper and recharged using a standard 230v domestic socket. This takes just one hour, or it can be recharged in two to four hours using a 400W solar panel accessory. Inside, the Nissan X Opus is equipped with cooking facilities, a seating/dining area and sleeping accommodation for up to six people. To meet the demands of the 'connected camper', the concept also delivers "an extensive specification to keep even the most tech-focused camper satisfied in the great outdoors” including a 230v outlet for powering household appliances, USB sockets for charging smartphones or other peripherals, LED lighting in the canopy, a 4G mobile WiFi hotspot for up to ten devices, and even a digital projector with pull-up screen for enjoying movies during the evenings. There’s also a 230v portable microwave, two-burner gas hob, and a fridge to keep campers well fed after a long day’s hike. On the outside, the X Opus is well-equipped for off-grid adventurers thanks to its off-road tires and alloy wheels, racks for two bicycles, and a kayak carrier mount. The Nissan X OPUS will be presented at the Caravan, Camping and Motorhome Show at The NEC, Birmingham, in the UK, from February 19-24. 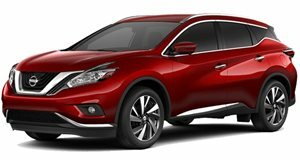 It’s trying to be the premium crossover that costs pennies to buy – but can the Nissan Murano actually pull off that tricky balancing act?